In college I took exactly one economics course, a low-level introduction to macroeconomics that was required of most students. It was almost cartoonishly boring, taught by a Ben Stein facsimile with a cardboard voice and silver beard, droning at four dozen barely awake non-majors while displaying scores of seemingly identical line graphs, each presenting some concept. I recall very few of those graphical theories, but the one that recently emerged from my mental sludge of collegiate miscellany was "diminishing marginal utility". I'm actually not sure my understanding of the theory is correct, but here's what I think it means: As the quantity of a good or service increases, the utility (or satisfaction, let's say) decreases. For instance, if you have one ice cream sandwich after dinner, it's probably incredible. You might stuff another, and while still good you'd find yourself enjoying it a tad less. If you tried for a third, your enjoyment would continue to diminish. Get it? Neither night would I be seated any closer to the stage than row R.
Wilco's last two albums are, as it stands, my least favorite of their catalog, and surely they'd occupy at least a portion of the setlist. Rigorous and convoluted travel plans meant two Georgia round trips in as many days. So perhaps this would be it. Perhaps, when walking to my car after the Atlanta show, I'd throw my hands up and say "It was a good run." But I wasn't about to twiddle my thumbs at home while a much revered band that had not yet shown any (live) weaknesses raged only a state away. As mentioned, my itinerary was all in tangles. Girlfriend in tow, we'd head to Savannah for night one, returning to Charleston post-gig with a 2 a.m. ETA. We'd be joined by the lady's sister the next morning (our reason for not traveling directly from Savannah to Atlanta.) Furthermore, we opted against a hotel in Atlanta and instead would make the five hour drive home in shifts, putting us back in the Holy City just before dawn. All told, 900 miles and 15 hours of driving for two concerts by a band I've already seen six times. Again, maybe this wasn't such a great idea. Resilient, we arrived in Savannah plenty early. Early enough to claim our tickets at will call without a line, early enough to nab a T-shirt hassle-free, early enough to scarf a gyro, and early enough to find our seats with time to spare. The Johnny Mercer Theater is an unspectacular albeit much smaller a venue than Wilco is accustomed to playing these days. Large, white, coffin-shaped acoustic fixtures hung from the ceiling like a squadron of fighter planes. The crowd was a strange blend of your standard Savannah college or post-college partier, and graying patrons of the arts. Speaking to the latter, I should mention that this performance was part of the Savannah Music Festival, and thus some tickets surely went to donors who may or may not know who or what a "Wilco" is. Photography was prohibited and being caught in the act was grounds for expulsion, but I did manage to snap one of the stage before the show. Actually a telling picture: Note the backwards baseball cap on the left, and the bald/gray heads in the middle. When the houselights fell, a robotic "Fitter/Happier" voice welcomed us, and informed us that while audio recording, shouting requests, and general merriment were allowed, there was to be no still/video photography lest our "night with Wilco end prematurely." It was lighthearted but also sort of sobering. It served to underscore the idea that Wilco is, for better or for worse, very much a brand, and they are concerned with protecting it. Of course they'd allow their brilliant musicianship to be recorded, but blurry stillshots and shaky video don't present the band in such a flattering light, do they? When the voice fell silent, the theme to "The Price Is Right!" blared (perhaps a subtle nod to that whole 'brand' thing), and Wilco took the stage just after 8 p.m. to much adulation, manning their instruments and launching into "Wilco (The Song)", the default opener for this tour. A moment of supreme corn ensued when, during the song's final chorus, the music stopped and the robotic voice returned and individually introduced the band members, spotlights and all, before the band leaped back in and finished the song out. It was an eyeroller of a moment, but I couldn't help but smile while I shook my head. Just a few words about the crowd: Frankly, one of the worst audiences I've been a part of from an attentiveness standpoint. We were mostly surrounded by twenty-somethings who were insistent upon conversing loudly throughout the night. It was quite remarkable, because they were certainly fans--hooting when particular songs started--but their attention spans were so crippled that they'd lose interest within seconds. Even the guy to my right--a young man in a Georgia Southern hat who would scream like a psycho at the beginning of songs and actually cursed at people for not clapping after a song--would take extended breaks to text or converse with his concert buddies. And this wasn't exclusive to our area. A hearty din swirled throughout, even during the acoustic set. But aside from Tweedy once mentioning the crowd was rowdy, the band paid no mind to the restlessness and, by the end of the night, had them all facing front and dancing wildly. Even the older folks, some of whom remained seated for most of the show, despite the bodies of standers-up obscuring their view. The band started into "Bull Black Nova", standout track from last year's patchy Wilco (the Album). Two songs so far, both from the new album...gulp. Thankfully, this was not to be a trend. Over the course of the night, the band reached as far back as Being There and relied heavily on Yankee Hotel Foxtrot, including the rare performance of "Pot Kettle Black" and an epic "Poor Places". All in all, we only heard five W(TA) songs, most of which were the more classically Wilco tracks ("BBN", "One Wing", "The Deeper Down"). Prior to the latter, Tweedy actually said, "This is from the new album. So...talk amongst yourselves." Actually savvy advice, since it was one of the few songs from either night that didn't land. While Nels cooked up the feedback melee of "Poor Places", something strange happened: Roadies scrambled onstage, assembling a new drumkit, hauling out a few keyboards, and scattering four lamps around the stagefront. When the chaos ended, the band set into a gorgeous nine-song stretch of acoustic songs that was everything I could have hoped for: A major-key version of "Spiders (Kidsmoke)" usually reserved for Tweedy's solo shows; a crushing "At My Window Sad and Lonely" with John Stirratt's harmonies sounding stronger than ever; the Loose Fur number, "Laminated Cat", which is a slightly rearranged version of "Not For the Season"; the all-too-rarely called-upon "She's a Jar". While Tweedy started into "Airline to Heaven", the roadies broke down the acoustic set-up, and it was clear by the time the band joined in to provide the well-paced build and flourishing outro. Wilco didn't let the excitement subside, playing another dozen songs, mostly explosive and upbeat. The expanded live version of "Ashes of American Flags" was a particular highlight, Nels' outro-solo fluttering skyward as the band built on a nice root-to-fourth progression. I really enjoy this version of "Ashes", because it ultimately casts the song in a different light. The extended solo isn't just a showcase for Nels, but also presents the song in a much more uplifting and optimistic context, one which certainly isn't possible (or intended) with the song as it is on record. Another bit of concert corn which I was more than happy to embrace was the performance "Jesus Etc. ", presented as an interactive sing-along, with Tweedy stepping back from the mic for the first 75% of the song. His review: Prior crowds sang it better, but at least this one gets to live in Savannah. Hardly a consolation to those of us from out of state, but who cares. "Heavy Metal Drummer" and "Via Chicago" are oft-played treats that highlight Glenn Kotche's talents. "Hate It Here", Sky Blue Sky dad-rock that I wish would be eradicated from the live set, was at least enough to get some of the older folks jostling. As the night rolled on, we kept assuming each song would be the set-closer, only to be met with yet another frenzy-inducing display. I present as evidence the last four songs of the set: "Walken", "I'm the Man Who Loves You", "Hoodoo Voodoo", and "I'm a Wheel". Incredible. The band even returned to the stage for a one-song encore, the Big Star tune "Thank You Friends" in tribute to Alex Chilton. All in all, 34 songs, many I hadn't previously heard and several rarities. It was more than worth the four hour round trip. But four hours isn't even half the journey that Friday's show would entail. 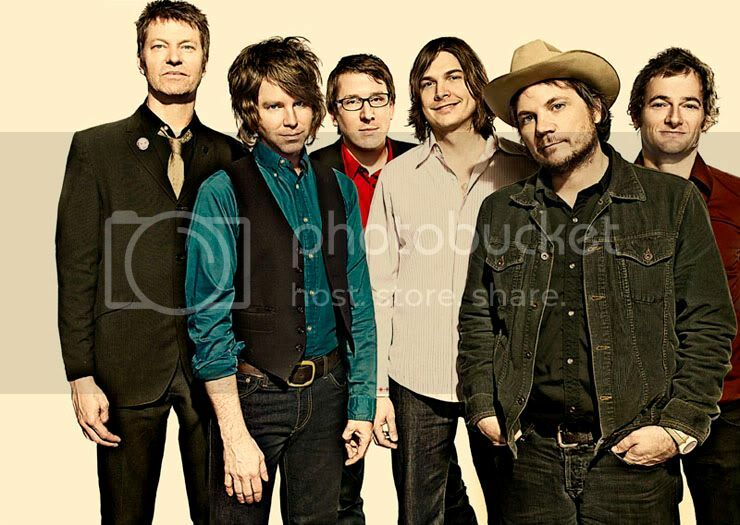 Could Wilco possibly validate a ten-hour round trip to see the same show again? 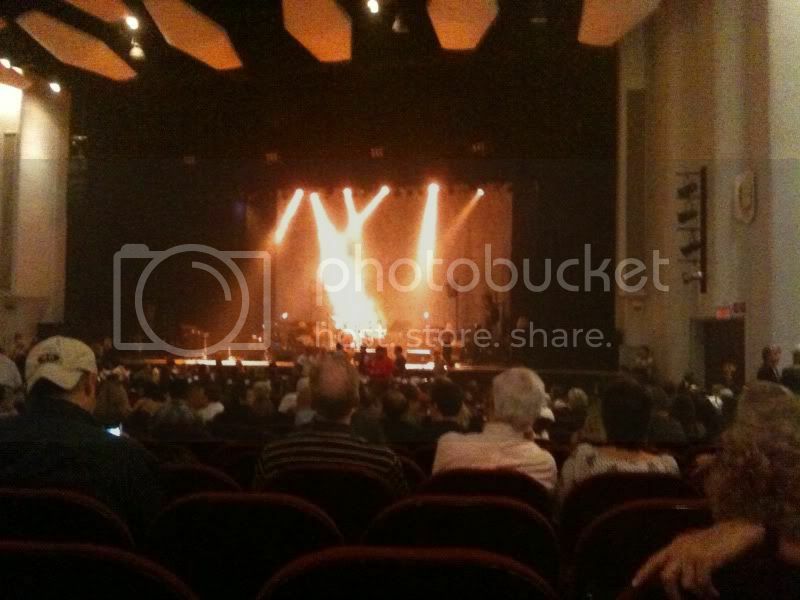 Find out tomorrow, when I'll review the Atlanta show and talk a bit about the Wilco experience and why it works. UPDATE: Gregg Allman was spotted in the front row. Cool, eh? Poor Places (interesting segue into acoustic set during "noise"